(6.5 UVB) 20 Minute Max, 32 Lamp 100 Watt w/ No Facials. Ultra Level Lamp for a Deep Rich Tan at an Economical Price. This Should Not be Considered an Entry Level Tanning Bed. (8.5 UVB) 15 Minute Max, 37 Lamp 100 Watt w/ 3-400 watt Facials. Superior Level Lamp with Enhanced UVB for Shorter Sessions without Compromising UVA. A Great Choice for the Serious Tanner Looking for Immediate Color. Not Recommended for Type I or a 1st Time Tanner! (3.2 UVB) 15 Minute Max, 40 Lamp 160 Watt w/ 3-400 Watt Facials. Premium Level Lamp with a Lower UVB Ratio. Perfect for the Tanner Who Prefers More of a Quality "Bronzing" or "Browning" Effect. 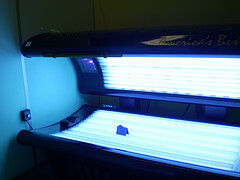 It may take additional sessions to achieve your desired color, however lower UVB provides a deeper, longer lasting tan. Use w/ caution, not for the beginner tanner. (9.5 UVB) 12 Minute Max, 52 Lamp 160 Watt w/ 4-500 Watt Facials. Extreme Level Lamp. This Bed is Best Suited for Type III or Higher Base Tans and Can Enhance Color to Perfection. A Must for the Seasoned Tanner Who has Reached a Plateau in Their Color Development. Recommended for the tanner who requires more room. (9 UVB) 10 Minute Max, 48 Bulb 180 Watt. Extreme Level Lamp. This Bed is Best Suited for Type III or Higher Base Tans and Can Enhance Color to Perfection. A Must for the Seasoned Tanner Who has Reached a Plateau in Their Color Development. Recommended for the Tanner Who Has Hard to Get Areas, Pressure Points, and or White Stripes. When applied, DHA (a sugar based derivative) reacts with proteins in the skin's superficial layer to form a golden brown color, it is not a dye, stain, or paint. Your skin begins to darken 2 to 3 hours after application and reaches its peak color within 24 hours. The color will gradually fade through natural exfoliation, just like a tan from the Sun. You'll be tan after one session, but it may take additional sessions to achieve your desired color. Once you reach your ideal color, you should be able to maintain it by spray tanning every 7 to 14 days. Our Spray Tanning solution will not give you an orange color. Once cured you will have a naturally, beautiful, bronze color. Guaranteed to show results! DHA has been approved for cosmetic use by the Food and Drug Administration. Red Light Therapy is a safe all natural process the encourages your body to naturally produce enzymes elastin fibers, and collagen that support the skin's structure.Thus producing a younger smoother firmer feeling skin. It has been found to be effective at repairing damaged skin, treating depression,relieving pain, treating wounds, killing acne causing bacteria, adding in cancer recovery, and much much more. (6.5 UVB), 20 minute max, 32 lamp, 100 watt w/ no facials. Ultra level lamp interchanged with Red Lamp Therapy lamps to provide the ultimate combination of the Red Lamp Therapy Bed and the Hot Bed Lamps. A Must Try for All customers!